We tend to do that. 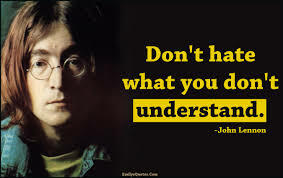 To hate what we don’t understand. After the last Amtrak accident, people may be a bit skittish about riding a train, but it’s nothing compared to how people felt in the 1820s with the invention of the steam locomotive. Anti-train propaganda warned that the human body would disintegrate under the stress of traveling at the unfathomable speed of 20mph. It was feared that men would asphyxiate, and women would suffer a more violent death due to their more fragile assembly. Stay away! In Harper Lee’s “To Kill a Mockingbird”, Jem, Scout, and Dill don’t know Arthur Radley (Boo). They only know what people say about him. They believe what they hear and in their minds, they make it reality. A scary reality. By the end of the story, Boo is no longer a man to fear, but a man who is a friend. Rod Serling’s “Twilight Zone” aired “The Gift” April 27, 1962. In the story, a space alien, who calls himself Williams, crash lands his rocket in Mexico. He has come to earth to give humanity the formula for a cancer-curing vaccine. He should be getting the red carpet! Right? But before presenting his gift, he’s killed by some local soldiers. Led by fear and hate, they not only kill the visitor but also burn the document that contains the cancer curing formula. What is the cure for our fear of the unknown? For Rod Serling, the cure is faith. The chief troll had it right when he told Elsa, in the movie “Frozen”, “Fear will be your enemy.” The fear that froze Elsa and everyone around her was thawed by the sacrificial love of her sister, Anna. Do you think the sacrificial love of Jesus will do the same for our fears and us?